"You're 3 Steps Away From The $370,000 DRISS Dental Grant"
DRISS (Modified Monash Model) Round Opening Soon! Testimonials from previous Successful DRISS Clients to be uploaded shortly. If you're considering applying for the Dental Relocation and Infrastructure Support Scheme (DRISS), then this page will educate you about the program. Is it any wonder why so many dentists are throwing in the towel? Over the last 5 years there have been 1,000+ articles and research papers highlighting the disadvantages faced by rural areas when compared with their metro areas. Yet, despite the overwhelming evidence base and the ongoing 'lip service' given to this issue (especially by politicians around election time), nothing much has changed over the years. Rural areas today still continue to be disadvantaged and experience poor oral health outcomes. Fortunately the Australian government has finally recognised the burden faced by rural dentists. The DRISS program has been created to provide up to $370,000 for dentists to relocate and setup / upgrade practices in rural areas. Getting a grant from the DRISS program will certainly help your practice as it provides up to $120,000 towards relocation and upto $250,000 towards infrastructure / equipment. However, having dealt with DOH in the past (particularly regarding the Chronic Disease Dental Scheme), you’re probably reluctant to invest time and energy to complete the grant application – and for good reasons. After all, the vast majority of grant applications are unsuccessful. Submitting a DRISS grant application that is rejected does not only lower morale but also wastes valuable resources... with nothing to show for it but a letter of rejection (even if it's politely worded... giving you hope but not funding). This is particularly true when you're asking for $300,000+ ...as it gets extremely competitive. 86% of Applicants were Unsuccessful! That's right... almost 9 out of 10 people who applied, were rejected. 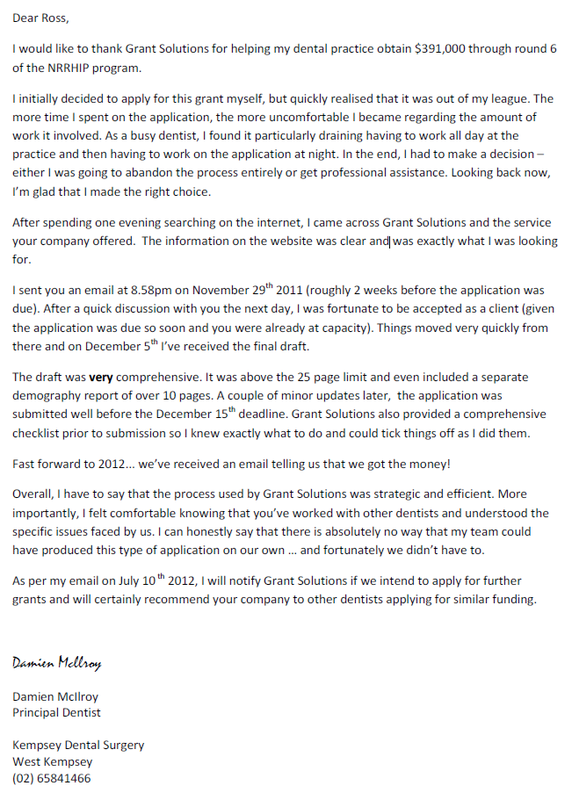 We’ve been working primarily with dentists (and other health professionals) for 5+ years and have found that while dentists are good at running a successful practice, they feel lost when it comes to applying for government grants. Can you relate to any (or all) of the above? If you've said Yes, then we can help you. DRISS is the Last Grant For Private Dentists! The government is desperately trying to cut spending in order to achieve a surplus and look 'financially responsible' before the election. Despite objections by dentists and patients they have already axed the Chronic Disease Dental Scheme on November 30, 2012 because it was costing too much. Therefore DRISS is likely to be your only opportunity to secure a government grant to relocate and setup a rural dental practice. When was the last time you successfully applied for a competitive government grant? Do you have time to read through 100+ pages of guidelines and supporting material? Comprehensive 10+ page demography analysis identifying unique service needs for the rural town you wish to relocate to. Our unique grant submission methodology will maximise your chance of being successful while minimising your involvement (as you probably have better things to do than to ‘stuff around’ with grant paperwork). We've recently completed a large number of health grants and received positive feedback from our clients (who rated us on average 9 out of 10). Many clients also expressed their ‘surprise’ at the amount of work involved– something they only realised once we delivered them the final application (which exceeded their expectations). However, the most important part (and this is what you should focus on) is that almost all of these 20+ clients were successful in obtaining between $300,000-$500,000 in health grants. That’s right, we had over 20 clients who were successful in getting grants because they’ve used our service! Best of all, Grant Solutions is primarily compensated on results (rather than effort). A major component of our compensation is only charged if the grant application is approved. Our consultants primarily deal with dentists, have interrogated oral health policy papers and know what the government is looking for. We have also been featured in the Public Accountant Magazine (August 2012 issue) with a 3 page article (which we’ll be happy to forward to you) covering the common mistakes made by grant applicants – and how to avoid them. We therefore expect that our clients will be successful (providing they are eligible and have genuine merit) while identical projects of non-clients will be deemed unsuccessful. The key point of difference will be our ability to communicate the value of these projects in a way that gets them ‘across the line’. Grant Solutions has successfully obtained grants between $300K and $7M grants for our clients. 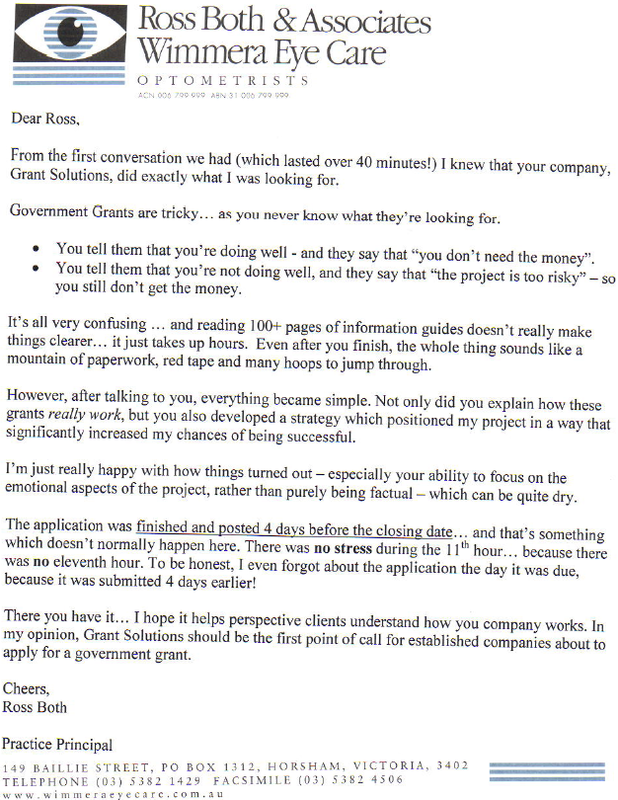 In the 4th NRRHIP round, Grant Solutions submitted 4 client application and 'got the money' for all of them. Sure, it wasn't easy (our consultants spent 50+ hours per application) but each client got the result they were looking for. In fact, 2 of our clients unsuccessfully applied themselves for previous NRRHIP rounds... and didn't want to (nor could they afford to) be rejected again. This time, they used our services… and were successful. Why did the other NRRHIP applications fail? The majority of unsuccessful submissions did have significant merit… but they were unable to successfully communicate that merit through the application form. 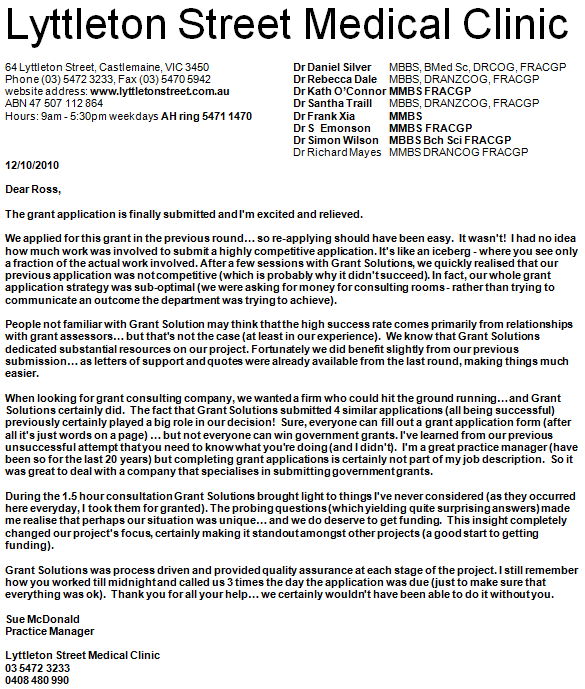 Even if they did a good job… there was still too much competition (302 applicants for 42 funded projects in Round 4). So ask yourself… is it worthwhile to invest 50+ hours into the grant application process, knowing that your chances of success is around 10%? Or wouldn't you rather invest that time into your business… and let Grant Solutions handle the DRISS application (so your chances of ‘getting the money’ improve dramatically)? Can the $370,000 DRISS Grant Help You? Sick of working in a 'Dental Glut' environment where dentistry has became a price driven commodity? Tired of dealing with rigid health funds which reduce your fees while being reliant upon them for patients? Over the congestion, peak hour traffic, parking issues and the overall rate race which exists in metro areas? Interested in being appreciated by your rural patients who will treasure the service you provide? Open to having a highly profitable practice - an asset which could later be sold for a substantial profit (enough to retire 2-3 years earlier)? If you’ve answered YES to more than 3 of these questions, then you should certainly take advantage of the DRISS grant. We won’t be able to handle the anticipated number of dentists needing our services -- especially as most approach us at the last minute when they realise just how much work is involved. We’ll try to help as many as possible, but once we’ve reached capacity… ‘all bets are off’. There will be a waiting list but regrettably many dentists will miss out. We want to help everyone… but will be forced to say ‘no’ to prevent our team from being overloaded and overwhelmed (especially as the submission deadline approaches). In each case these requests were regrettably but firmly declined (as we’ve already had a long waiting list). Realistically you probably have only a few days to decide before that decision is made for you. We’re happy to answer questions, provided that you’ve carefully read all the information available on this page. Please keep in mind that we’ll be working at capacity and our priority will be to assist existing clients with their projects (rather than focusing on acquiring new clients) - especially as the deadline approaches. Sounds FAIR doesn't it? We think so and so did our satisfied DRISS clients. A range of incentives to attract more dentists to rural communities has been unveiled today with the launch of the Dental Relocation and Infrastructure Support Scheme (DRISS). The federally funded scheme offers dentists relocation payments up to $120,000 plus grants up to $250,000 to help with the purchase of equipment and dental infrastructure. DRISS is administered by Rural Health Workforce Australia (RHWA) on behalf of the Federal Department of Health and Ageing. It is being delivered in partnership with the national network of Rural Workforce Agencies. “The Federal Government is investing significantly in dental health and we are proud to be associated with a program like this be cause there is real need for more dental services in rural and remote Australia,” says RHWA CEO, Greg Sam. DRISS will provide more than $77 million over three years, with the first round of applications open from 26 August - 4 October 2013. Dentists can apply for relocation and infrastructure grants to assist in establishing a new practice or building onto an existing practice. The grant may not cover all the expenses involved in establishing a practice, but will be a contribution towards these costs. DRISS is governed by a Steering Committee including representatives of the Department of Health and Ageing, RHWA, the Australian Dental Association, the National Rural Health Alliance, and Services for Australian Rural and Remote Allied Health. Support dentists who are relocating to more regional and remote locations within Australia by providing relocation and infrastructure support grants. Increase the number of new practices and expand the services of existing private practices. Address the needs of regional and remote communities and improve access to dental services by providing funding to establish new, and expand existing dental practices. Increase the retention of dentists in regional and remote areas. Support dentists to establish and enhance private dental services in regional and remote communities. Provide information and support to dentists about DRISS. Have general registration as a dentist with the Dental Board of Australia. Be a permanent resident of Australia or be an Australian citizen. Carry out private practice or a combination of private and public practice in the relocation destination**. Be relocating to a location that is more regional or remote than the current practice, based on the Australian Standard Geographical Classification – Remoteness Area (ASGC - RA). Be providing predominantly general dental services. Relocate on or after 1 July 2013. How much grant funding can a dentist get? Relocation grants ranging from $15,000 up to $120,000, calculated according to the area the dentist is moving to as well as the area the dentist is moving from. The scaling of relocation grants provides higher incentives for dentists relocating to more remote areas to encourage better distribution of the dental workforce. Infrastructure grants of up to $250,000 to help with the purchase and fit-out of dental facilities and equipment. Dentists relocating from metropolitan to very remote areas may be eligible for grants up to $370,000. Applicants must be moving to a more remote area to be eligible for DRISS e.g. relocating from RA 2 to RA 3. Applicants relocating to an area within the same ASGC-RA category are not eligible for funding under DRISS. Successful applicants who are setting up a new practice are entitled to the full relocation payment amount immediately after relocating and commencing practice. Successful applicants who are relocating to become salaried employees of a private practice are required to show evidence of employment arrangements. Salaried applicants will receive 50% of the agreed payment amount 6 months after commencing service and a final 50% payment 12 months after commencing service. If an applicant is not currently practicing, the proposed location must be more remote than the most recent location of dental practice. An applicant must have worked at their most recent dental practice within the last 12 months. The infrastructure grant payment is designed for applicants who are relocating to a more remote area and wish to undertake capital works or purchase/upgrade dental equipment to support their practice. Ongoing recurrent costs such as operating costs.